Who will Democrats pick to run for governor in 2018? Nevada’s next election is a long way off on the calendar, but nearing quickly for politicians planning to run for governor. On the Republican side, Attorney General Adam Laxalt is clearing the field: U.S. Sen. Dean Heller is going to run for re-election, and Lt. Gov. Mark Hutchison won’t seek a promotion. Although Laxalt won his 2014 race by just 4,750 votes, he’s been busy keeping his campaign promise to sue the federal government a lot. On the Democratic side, the 2018 governor’s race will be one of the first tests of the Harry Reid machine after Reid’s retirement. Back in 2014, the machine produced a flop: No high-profile candidates decided to run, and None of These Candidates won the primary. Will there be another flop in 2018? Here’s a few candidates the party might embrace. Also, there’s the curse of the commission: The last politician to rise to higher office was Lorraine Hunt-Bono, who served two terms as lieutenant governor. More often than not, commissioners don’t have much luck seeking promotions. State Senate Majority Leader Aaron Ford: Capturing the majority was just a step on Ford’s master political plan, although he demurred recently when I asked him in a TV interview if he was considering a run for governor. He’ll have to show what he’s got as leader in the coming session and he’ll have to introduce himself to voters outside his Senate district if he’s to be successful. 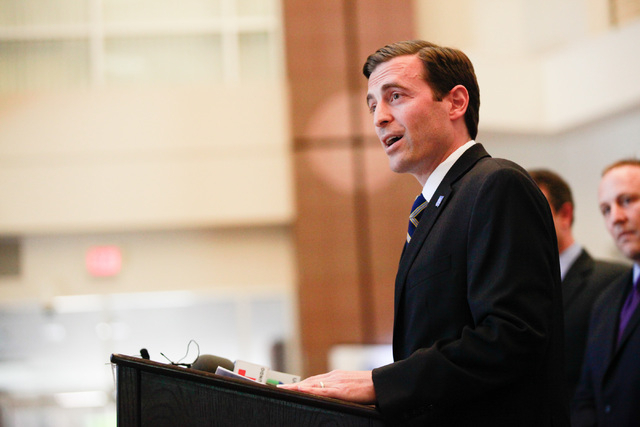 An alternative might be to run instead for Laxalt’s job as attorney general. State Sen. Tick Segerblom: A progressive and a supporter of Bernie Sanders’s campaign, Segerblom was prepared to make a Sanders-like run against Gov. Brian Sandoval in 2014, but Reid declined to sign off. Segerblom’s support for recreational marijuana (which passed comfortably in 2016, especially in counties a statewide Democratic candidate needs) should help. U.S. Rep. Dina Titus: Titus ran for governor in 2006, losing to Republican Jim Gibbons. Gibbons went on to set records for the most vetoes and most veto overrides. While Titus is open to seeking higher office, the temptation would have to be strong to lure her out of one of the safest Democratic House seats in the nation. Ross Miller: The former secretary of state lost to Laxalt in the AG’s 2014 contest, so a governor’s race would not only be a rematch but also a fulfillment of Miller’s longtime goal to be the first son to succeed his father in the governor’s mansion. (Bob Miller served from 1989 to 1999.) But the younger Miller would have to draw himself away from a successful law practice to make a bid. Barbara Buckley: The first woman to serve as Assembly speaker left politics after term limits forced her out. She now concentrates her energy on the successful Legal Aid Center of Southern Nevada. Buckley was courted as a candidate before, but declined due to family obligations. It’s possible the political fire may still be smoldering. Steve Cloobeck: The longtime hotelier and Democratic donor (and “Undercover Boss” star) also considered running before, and has substantial net worth, enough to self-fund a bid. And the moment may be right for him, as a businessman without prior political experience is about to be sworn in as president. Steve Sebelius is a Review-Journal political columnist. Follow him on Twitter (@SteveSebelius) or reach him at 702-387-5276 or SSebelius@reviewjournal.com.